Previously on “Nick Strangis previews the Arizona Diamondbacks”, I suggested that the 2016 Diamondbacks resembled a real life Shrodinger’s Cat – they were simultaneously a young-ish team with loads of untapped talent and incredible upside but also a disaster full of failed top prospects ready to implode. Narrator voice: Little did Nick know, they were wholly the latter. Surprisingly, most of the raw talent the Diamondbacks brought to the awful 2016 season stuck around for 2017 and the cohort improved by twenty-six wins. Zack Greinke returned to form, Robbie Ray continued his upward trajectory, and the team acquired J.D. Martinez to help push a struggling offense into a postseason berth. The pitching staff, projected to be among the league’s worst, was among the league’s best. The team was so good in 2017 that PECOTA projects they will win 87 games in 2018, enough to host the NL Wild Card game. The problem is that this story is unbelievable because these Diamondbacks simply should not exist. Let me explain. How do they score runs? Do they get contributions from many or a few players? The Arizona Diamondbacks cannot score runs because it is impossible for players who don’t exist to hit baseballs. Teams don’t find stars in the eighth round of the amateur draft, especially not at first base. Occasionally, a role player like Adam Lind or Hal Morris pops up, but only once in a generation does a team find a star there. It’s unfathomable that the Diamondbacks could have found one of the best hitters in baseball there and it’s even more ridiculous to suggest that Josh Byrnes, who was fired in 2010 and couldn’t hold onto a job in Arizona or San Diego, drafted two of the best players on a playoff-caliber team in 2018. Author’s note: Wait, this says J.D. Martinez was the third best hitter in baseball last year? Author’s note: What dimension is this? In any case, it is impossible to imagine a playoff-caliber offense that is built around never-hyped homegrown prospects, a former indy-ball player, late bloomers, and players whom only a machine could love. Players like these, or at least a critical mass of players like this, do not form major league rosters and certainly do not form successful major league rosters, so the DBacks’ offense does not exist and we should refuse to believe otherwise. The DBacks are also carrying seven players in Spring Training who are vying for bench spots. Three of those players play two or more positions. 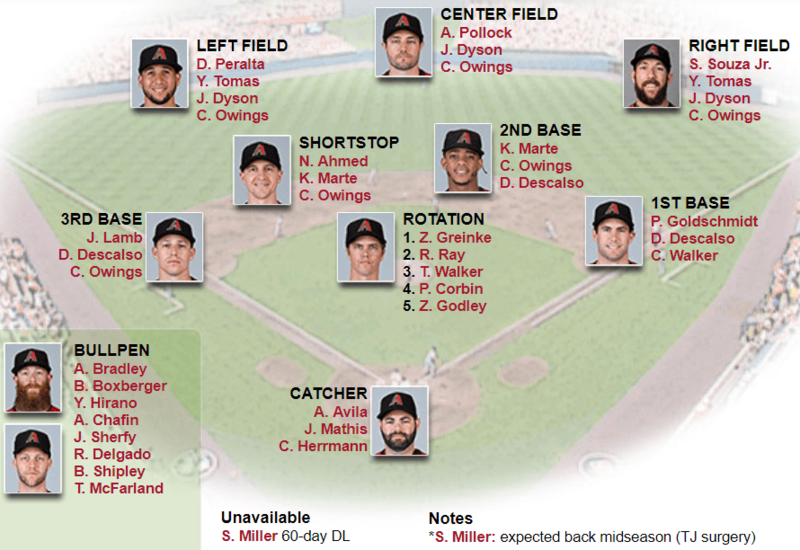 Remember 2015, when this team entered Spring Training with twelve (12!) possible starting pitchers? This is kind of like, that only with hitters. An NL team typically carries thirteen positions players, meaning the DBacks can only take five bench players into the season. Maybe it’s time to consider if they really need a third catcher, who also plays outfield, but is a below-average pitch framer and hitter. They could also trade Yasmany Tomas, the one dimensional outfielder who doesn’t belong in this dimension, where the DBacks will fight for playoff contention. We see what you’re doing, Mike Hazen, and you can’t have seven bench players. Are the hitters notably aggressive or patient? If you could convince someone that the Diamondbacks’ hitters exist, you could make a case that they were nearly a three true outcomes team in 2017. They finished with the seventh best walk rate and sixth worst strikeout rate thanks for a penchant for laying off pitches outside the zone and failing to hit pitches in the zone. They hit the ball hard, leading to the fourth best HR/FB ratio. Newcomers Stephen Souza and Alex Avila will add their high walk rates, high strikeout rates, and high isolated power numbers to this year’s lineup. Avila wasn’t good enough to be a starter on a couple bad teams in recent years, but he started hitting the ball hard in 2016 and his new hitting profile indicates he is a card-carrying member of the new school of flyball hungry hitters. Where are the pressure points? Who might need to be replaced? The outfield could not stay healthy in 2017. Only five players on the team logged more than 400 plate appearances. The pressure will be on the team’s reserves to carry their share of the load if this team’s injury history is a predictor of events to come. Thankfully for the DBacks, this team is loaded with depth. Fitting the model of the team, they have plenty of quantum entangled players on hand who look simultaneously good and terrible and we just won’t know what they do until they do it. 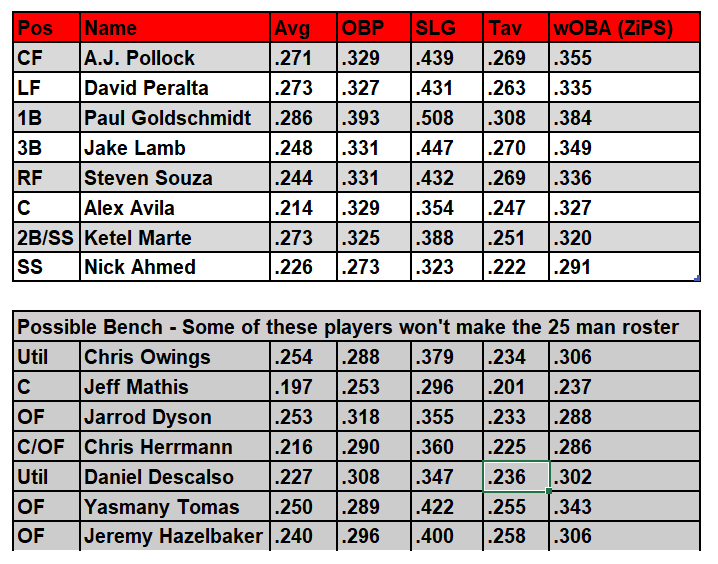 A case study: Jeremy Hazelbaker was a 29-year-old rookie in 2016 who posted a 102 wRC+ for the Cardinals and then posted a 156 wRC+ in his 30-year-old sophomore season because, recently, players can just decide to suddenly be good hitters and it works. Are park factors a large or small consideration? Does the team’s park favor a particular batter type or handedness? Chase Field usually favored left-handed hitters in past seasons, until it suddenly and significantly shifted to favoring right-handed hitters in 2016 and ‘17. This could all be a moot point, as the Diamondbacks will officially use a humidor in 2018. Construction began on the humidor in 2017 but the team never got around to using it, and their pitchers did not need it. The high altitude and dry air around Phoenix means the Diamondbacks did not hit as well in 2017 as raw stats would indicate. Among full-season DBacks’ starters in 2018, only Lamb and Goldschmidt finished in the top twenty hitters at their position by wRC+ last season. That was a pretty good season for two players who shouldn’t exist. What is their balance between pitching and fielding? Is the starting rotation generally a flat one, or one dominated by one or two aces? Does the manager allow his starters (or some subset of them) to go especially deep into games? Do the starters share common characteristics, or are there any philosophies the team’s pitching coach seems to drill into each? Here is more evidence the Diamondbacks do not exist. Last season, their staff ace, Zack Greinke, re-established himself as one of the game’s best starting pitchers, in spite of the fact that his fastball velocity did not rebound from 2016. He pitched over 200 innings and relied on his excellent command of his three above-average pitches to increase his strikeout rate and allow fewer home runs. The problem is that Zack Greinke can’t have pitched for the Diamondbacks because he quit baseball in 2007. Greinke is followed in the rotation by Robbie Ray, who struggled with his control and allowing too many home runs in Detroit, a very forgiving park. Chase Field is not a park a struggling young pitcher wants to end up in, just ask Shelby Miller. Ray defied the odds and morphed into one of the game’s premier strikeout artists, helping him achieve one of the best K%-BB% ratios in baseball last season. In an environment where fly balls fly farther than in other parks, the Diamondbacks struck gold in ground ball specialists Taijuan Walker, Patrick Corbin, and Zack Godley, who all finished in the top 30 starters in ground ball percentage in 2017. Like Ray, Walker left the friendly confines of one of the best pitching parks in baseball, Safeco Field, for Chase Field and surprisingly found a home in the desert atmosphere. Because they received so much assistance from their defense in 2017, ZiPS projects Walker and Corbin to be worse pitchers than Godley in 2018. Godley struck out batters at an ungodly rate in the minor leagues and he could be a pitcher to watch in 2018. For the benefit of pitchers like Corbin and Walker, the Diamondbacks’ defense improved this off-season, with the additions of Souza and back-up outfielder Jarrod Dyson. On the whole, the Diamondbacks’ pitching staff focused on the things a pitcher can control last season, finishing sixth in the majors in K%-BB% (15.9%). This led to a fifth best finish in FanGraphs WAR (which focuses on FIP rather than R/9) for the staff. This is the kind of performance any team in baseball could ride to the post-season, assuming the offense can provide the run support needed. The new humidor should prevent balls from flying as easily through the arid Phoenix air but this staff did not need the assistance last season. Important questions facing the staff for 2018 included Greinke’s diminished fastball velocity, which squashed his performance in 2016 but did not prevent him from regaining his form as a premier starter in 2017. Greinke pitched over 200 innings for the first time since his final season as a Dodger, in 2015, but it is unclear if, at 34 years of age, he can again carry the top of the rotation. Zack Godley was a late bloomer, who headlined the of a much-maligned trade that sent Miguel Montero to the Cubs during the 2014-15 off-season. Sometimes the league makes adjustments after seeing young pitchers like Godley dominate them in their early careers, so time will tell if he can continue his success. Tenth-round pitchers rarely make any sort of impact at the Major League level, but he’s given the DBacks a much needed dangerous weapon at the bottom of their rotation. Against all odds, the pitcher who nearly quit baseball (Greinke), the pitchers who were acquired without high expectations (Walker, Ray, Godley) in trades, and the pitcher we nearly forgot about (Corbin) led this team to one of baseball’s best pitching rotation performances in 2017. The relied on their own stuff last season and could get better this season with a better defense behind them and a humidor to suppress power hitting. Very little about their performance sends a strong warning for 2018. On top of the excellent starting rotation, Shelby Miller, who was getting back on track in 2017 after a disastrous 2016, will be rehabbing for half of 2018, and could return to give their rotation depth or relief by mid-season. How do they run their bullpen? There are three potential closers, Archie Bradley, a former top pitching prospect in all of baseball, newly signed Japanese reliever Yoshihisa Hirano, and Brad Boxberger on the DBacks’ roster. Unfortunately for one of the best bullpens in baseball in 2017, team bullpen performance is highly unpredictable. Fortunately for the DBacks, individual performance is less unpredictable and the DBacks jettisoned the most troubling of their 2017 relievers in favor of Hirano and Boxberger. Boxberger has seen his share of injury troubles, and it is often difficult to predict success for players moving into Major League Baseball from Japan, so the safe bet would be on Bradley taking the ball when the DBacks need someone to clear the slate in late-inning high-leverage situations. Bradley fits the mold of the rest of the team, as he was among baseball’s best pitching prospects before the 2014 season. Command and control issues derailed his path to Major League Baseball, but his stuff and mix of pitchers make him a nasty reliever. Alex Avila, the likely starting catcher for 2018, has never been considered a strong pitch framer. Thankfully for the DBacks, Jeff Mathis is one of the game’s best framers. Here’s a meme to explain the strange history of Jeff Mathis’ career. The projections and predictions are clear: the Diamondbacks are expected to make the playoffs in 2018. The hype in Phoenix is real, too: nearly 30,000 fans showed up to the team’s fan fest at the start of Spring Training. I arrived at Salt River Fields on that Saturday in February expecting the usual trickling in of confused baseball fans that attend other fan fest events but never made it through the gate because I couldn’t imagine dragging my family through a 30 minute wait in order to get in. When I volunteered to write previews for the upstart Banished to the Pen in 2015, I picked the Diamondbacks because I wanted to try to understand what the hell was going on in Arizona. I found a bizarre mix of stars and rough talent amidst the chaos. It was a team only a long time Cubs fan could love (and there are plenty of former Cubs fans in Phoenix). 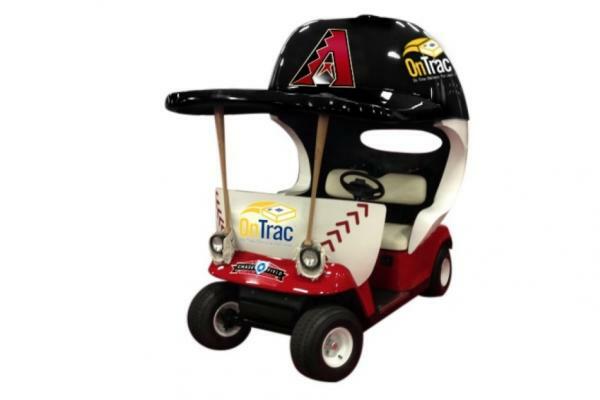 The Diamondbacks are the first team Mike Hazen has helmed, the last team Kevin Towers would ever helm, and the only team Dave Stewart will ever helm. It took these three front offices, plus the significant contributions of Josh Byrnes, to cobble together this strange mix of players. Every player drafted or signed as an amateur has long odds and high hurdles to overcome to make it to the major leagues but, unlike other contenders, the Diamondbacks are constructed largely from players who never were supposed to be good or who failed hard in their first attempts to make it in Major League Baseball. This team is one of the best stories in baseball and we should all hope for the best for the team that simply shouldn’t be. Season Prediction: 88 wins (taking the over on the PECOTA projections thanks to the horrible state of tanking in the NL), NLCS loss to the Chicago Cubs. If it makes you feel any better Jarrod Dyson is a 50th round pick by Kansas City.